Wódkiewicz, Maciej Chwedorzewska, Katarzyna J. Bednarek, Piotr T. Znój, Anna Androsiuk, Piotr and Galera, Halina 2018. How much of the invader's genetic variability can slip between our fingers? A case study of secondary dispersal of Poa annua on King George Island (Antarctica). Ecology and Evolution, Vol. 8, Issue. 1, p. 592. Ruiz-Fernández, Jesús Oliva, Marc and García-Hernández, Cristina 2017. Topographic and geomorphologic controls on the distribution of vegetation formations in Elephant Point (Livingston Island, Maritime Antarctica). Science of The Total Environment, Vol. 587-588, Issue. , p. 340. Fuentes-Lillo, Eduardo Cuba-Díaz, Marely and Rifo, Sergio 2017. Morpho-physiological response of Colobanthus quitensis and Juncus bufonius under different simulations of climate change. Polar Science, Vol. 11, Issue. , p. 11. Bölter, Manfred and Müller, Felix 2016. Resilience in polar ecosystems: From drivers to impacts and changes. Polar Science, Vol. 10, Issue. 1, p. 52. Pertierra, Luis R. Baker, Matthew Howard, Chris Vega, Greta C. Olalla-Tarraga, Miguel A. and Scott, Jenny 2016. Assessing the invasive risk of two non-native Agrostis species on sub-Antarctic Macquarie Island. Polar Biology, Vol. 39, Issue. 12, p. 2361. Chwedorzewska, K.J. Giełwanowska, I. Olech, M. Molina-Montenegro, M.A. Wódkiewicz, M. and Galera, H. 2015. 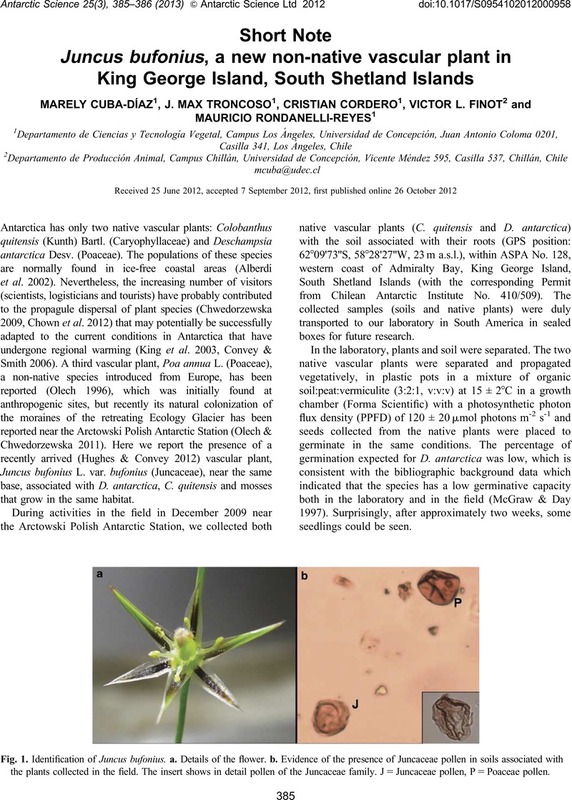 Poa annua L. in the maritime Antarctic: an overview. Polar Record, Vol. 51, Issue. 06, p. 637. Lee, Jennifer E. Terauds, Aleks and Chown, Steven L. 2014. Natural dispersal to sub-Antarctic Marion Island of two arthropod species. Polar Biology, Vol. 37, Issue. 6, p. 781. Pertierra, Luis R. Lara, Francisco Benayas, Javier and Hughes, Kevin A. 2013. Poa pratensis L., current status of the longest-established non-native vascular plant in the Antarctic. Polar Biology, Vol. 36, Issue. 10, p. 1473. Wódkiewicz, Maciej Galera, Halina Chwedorzewska, Katarzyna J. Giełwanowska, Irena and Olech, Maria 2013. Diaspores of the Introduced Species Poa annua L. in Soil Samples from King George Island (South Shetlands, Antarctica). Arctic, Antarctic, and Alpine Research, Vol. 45, Issue. 3, p. 415. Alberdi, M., Bravo, L.A., Gutiérrez, A., Gidekel, M.Corcuera, L.J. 2002. Ecophysiology of Antarctic vascular plants. Physiologia Plantarum, 115, 479–486. Convey, P.Smith, R.I.L. 2006. Responses of terrestrial Antarctic ecosystems to climate change. Plant Ecology, 182, 1–10. Chown, S.L., Huiskes, A.H.L., Gremmen, N.J.M., Lee, J.E., Terauds, A., Crosbie, K., Frenot, Y., Hughes, K.A., Imura, S., Kiefer, K., Lebouvier, M., Raymond, B., Tsujimoto, M., Ware, C., van De Vijver, B.Bergstrom, D.M. 2012. Continent-wide risk assessment for the establishment of nonindigenous species in Antarctica. Proceeding of the National Academy of Sciences of the United States of America, 109, 4938–4943. Chwedorzewska, K.J. 2009. Terrestrial Antarctic ecosystems in the changing world: an overview. Polish Polar Research, 30, 263–276. Frenot, Y., Chown, S.L., Whinam, J., Selkirk, P.M., Convey, P., Skotnicki, M.Bergstrom, D.M. 2005. Biological invasions in the Antarctic: extent, impacts and implications. Biological Reviews, 80, 45–72. Hughes, K.A.Convey, P. 2012. Determining the native/non-native status of newly discovered terrestrial and freshwater species in Antarctica: current knowledge, methodology and management action. Journal of Environmental Management, 93, 52–66. Hughes, K.A.Worland, M.R. 2010. Spatial distribution, habitat preference and colonization status of two alien terrestrial invertebrate species in Antarctica. Antarctic Science, 22, 221–231. Hughes, K.A., Convey, P., Maslen, N.R.Smith, R.I.L. 2010. Accidental transfer of non-native soil organisms into Antarctica on construction vehicles. Biological Invasions, 12, 875–891. King, J.C., Turner, J., Marshall, G.J., Conolley, W.M.Lachlan-Cope, T.A. 2003. Antarctic Peninsula climate variability and its causes as revealed by analysis of instrumental records. Antarctic Research Series, 79, 17–30. McGraw, J.B.Day, T.A. 1997. Size and characteristics of a natural seed bank in Antarctic. Arctic and Alpine Research, 29, 213–216. Moore, D.M. 1983. Flora of Tierra del Fuego. Oswestry: Anthony Nelson, 338 pp. Olech, M. 1996. Human impact on terrestrial ecosystems in west Antarctica. Proceedings of the NIPR Symposium on Polar Biology, 9, 299–306. Olech, M.Chwedorzewska, K.J. 2011. The first appearance and establishment of an alien vascular plant in natural habitats on the forefield of a retreating glacier in Antarctica. Antarctic Science, 23, 153–154. Schmidt, W. 1989. Plant dispersal by motor cars. Plant Ecology, 80, 147–152. Wester, L. 1992. Origin and distribution of adventive alien flowering plants in Hawaii. In Stone, C.P., Smith, C.W. & Tunisson, J.T., eds. Alien plant invasions in native ecosystems of Hawaii: management and research. Honolulu, HI: University of Hawaii Co-operative National Park Resources Studies Unit, 99–154.